This Minecraft build wasn't inspired by a real hotel, which is a shame 'cause I'd love to go there. It actually reminds me a bit of the Panau Falls Casino from Just Cause 2. 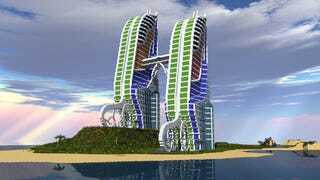 In any case, the build is called the Twin Palms Hotel and it was submitted to Planet Minecraft by Jaden024. Look below for more screenshots.